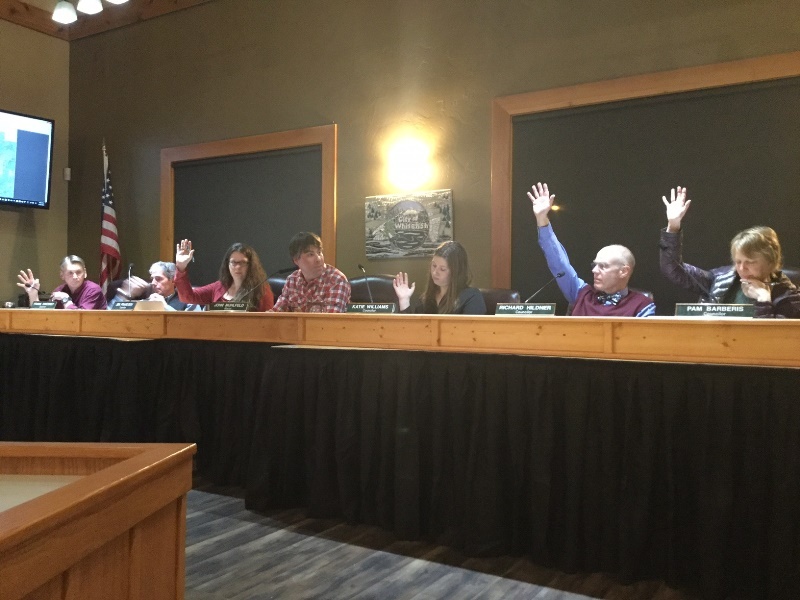 After many years of negotiations and hard work, the City of Whitefish officially adopted the Haskill Basin Conservation Easement, Waterline Easement and Trail Easement at the Council meeting held January 19, 2016. These permanent easements guarantee the protection of the community’s municipal water supply and important wildlife habitat, and they also allow the Whitefish Trail to make its debut on the east side of Whitefish Lake. Whitefish Legacy Partners presented plans for a new WT trailhead at the City water treatment plant, within ½ mile of the Wisconsin Avenue paved bike path. In partnership with the City, Iron Horse and Winter Sports Inc., WLP has designed a 5 ½ mile trail corridor with scenic destinations along the western portion of the 3,022 acre conservation easement. The trail will connect to Whitefish Mountain Resort with a new trailhead on Big Mountain Road that will also serve as the “Winter” Whitefish Trail. The access will tie the Whitefish Trail to the groomed Nordic trails in Haskill Basin in partnership with Whitefish Mtn. Resort, Glacier Nordic Club, and Iron Horse. Whitefish Legacy Partners is excited to present the ‘recreation gateway’ to Haskill Basin and this community-minded project that blends public and numerous private entities to create another innovative project on the Whitefish Trail. F.H. Stoltze Land and Lumber Company and The Trust for Public Land worked tirelessly with the City of Whitefish and Montana Fish, Wildlife and Parks to negotiate the easements to permanently remove the development rights and protect the land for water, wildlife, recreation, and sustainable timber management. Funding for the conservation easement came from the federal Forest Legacy Program, the U.S. Fish and Wildlife Service Habitat Conservation Plan Land Acquisition Program, and a reduction in the purchase price from Stoltze. The remaining balance comes from a 1% increase in the resort tax which was overwhelmingly supported by 84% of Whitefish voters in the spring of 2015. Funding for the recreation aspect of the project will be initiated by WLP in 2016 in hopes of beginning construction Spring 2017. Whitefish Legacy Partners would like to thank all of the partners involved in this project as well as the entire Whitefish community. We are excited to ‘close the loop’ of the Whitefish Trail around Whitefish Lake and connect our ‘Places Worth Protecting’ in upcoming years. Haskill Basin is our next gateway to a remarkable legacy of community and conservation on the Whitefish Trail.